Tropical Enclosures is a pool and patio enclosure company serving the Jacksonville and North Florida area. Tropical Enclosure has operated a website for some years. With advancing technology and the rise of social media, Tropical Enclosure needs to redesign their website to align with the goals of the business and the target audience. Tropical Enclosure needs a website that functions as a powerful marketing and communications tool to attract new clients, positions itself as a leader in the industry, increase leads and further promote itself a professional company on and off the internet. 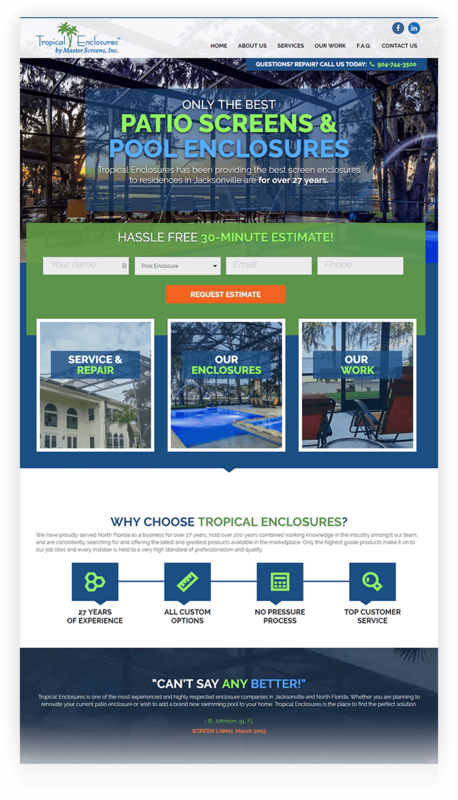 AnoLogix created a responsive WordPress website that allows the Tropical Enclosure staff to easily update content and add new pictures of completed jobs. The site is easy to navigate allowing customers to quickly find the information they need and request an estimate if desired. Since the website has launched, Tropical Enclosures has seen a 40 percent increase in revenue.